Despite recent consternation in the blogosphere and rumor mill, no cutoff looms yet for Oakland’s bid to be a host city for the 2018 or 2022 World Cup, the worldwide soccer championship, according to a USA Bid Committee spokesperson. A smattering of internet mentions and announcements had tabbed this Friday, December 4, as the deadline for Oakland to collect 50,000 online signatures supporting its attempt to hold international matches at the Coliseum a decade from now. Not exactly, says the USA Bid Committee’s director of communications, Jurgen Mainka. While December 4 is not a cutoff date for cities to reach any sort of support threshold, Mainka said, the date does hold some significance for the twelve countries hoping eventually to welcome hordes of international soccer fans. On Friday, contending nations will make an initial general presentation in Capetown, South Africa, to international soccer organization FIFA, which puts on the World Cup, and a small group of worldwide media. But countries’ final pitches aren’t due until May 14. In order for Oakland and other American cities to have any shot at hosting matches in 2018 or 2022, Mainka said, the USA Bid Committee will first have to impress FIFA in May with a 1,500-page “bid book” detailing its blueprint for hosting a tremendous event nationally. “We are essentially delivering a World Cup in a book,” Mainka said. Australia, England, Indonesia, Japan, and Russia are also contending to host in either 2018 or 2022, while joint bids for the same goal have been launched by Belgium and the Netherlands, as well as Spain and Portugal. Qatar and South Korea are individually in the running for 2022. The World Cup is held every four years, and is scheduled to take place in South Africa next summer and in Brazil in 2014. Before handing in its bid book, Mainka said, the American committee will trim down its list of 27 hopeful cities to 18 by the end of this year or early 2010. So that should be the first occasion for breath-holding by Oakland’s fútbol fanatics, who can breathe easy for the time being. “From a production standpoint, for efficiency, we want to pare that list down early so we can focus more closely on those 18 cities and stadiums that will be in our bid book,” Mainka said. While loads of votes for Oakland could certainly help the local cause, Mainka said, regional fan support is not the only or even the main deciding factor. Other host-city considerations include facilities, transportation infrastructure, environmental sustainability, and safety. “We want to show FIFA that we are not only capable of hosting an unbelievably technically sound bid, but that we’ll also have five million people buying tickets and passionate fans filling stadiums,” Mainka said of the American attempt. FIFA is slated to announce the 2018 and 2022 host countries in December 2010. Should the United States be selected for either year, Mainka said, FIFA officials would work closely with American representatives to identify which of the 18 bid book cities would actually host matches. Traditionally, World Cup matches are held at twelve sites throughout the host country, though that is not always the case; when the 1994 World Cup was held in the United States, matches were only played at nine sites, and during next summer’s event in South Africa matches will likely be held at just ten sites. 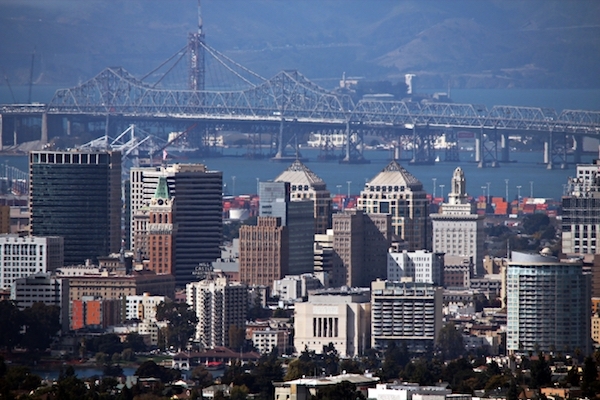 If Oakland does make it into the bid book and the United States is picked for either of the two events, Mainka said, match-hosting cities be won’t be chosen until four or five years before the event. That means, even if everything does break in Oakland’s favor next January and December, locals likely won’t know for certain that the Coliseum will someday host future World Cup matches until sometime between 2013 and 2018. With that in mind, city representatives continue their effort to reach out to fans and drum up local support as the USA Bid Committee prepares to slim the field of prospective host cities, said Michael Hunt, an aide to vice mayor and city councilmember Ignacio De La Fuente who has been active in Oakland’s push. While Oakland may not have as many online petitioners on board as cities like Seattle, Hunt and others remain optimistic about their town’s chances.